How pawesome that New Year's Eve falls on Thankful Thursday. This is the purrfect time to be grateful for everything we've been blessed with this year. First and foremost, though I lost my sweet girl Rosie in May of this year, I am grateful beyond words for every moment I had with her in 2015, and every year before that. Rosie will always be my baby girl, and I will love her always and forever, no matter what year it is. 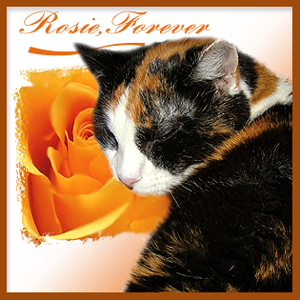 Thank you, Ann from Zoolatry, for creating this beautiful memorial image for my Rosie after I lost her in May. It means more to me than I could ever describe. On this final Thankful Thursday and final day of 2015, I am also grateful for my parents, my sister, and all of my family, of course including all of the furbabies currently in my life. I am grateful every day for my sweet pup Astrid, for my special boy Evan, for my sweet little Thimble, and for my newest 2015 addition - my happy and active Eddy. I am thankful for our furry housemate Toby, my sister's cat and Thimble's brother. And I am grateful for the visits I have with my parents' sweet cats - Thimble's other brothers Trapper and Talon, and their new little sisters Gemma and Freya. 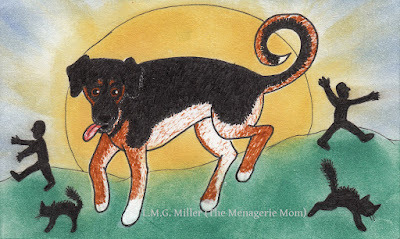 And, of course, I am thankful for all of my you, my blogging friends and furiends! Although it was born in 2014, it wasn't until earlier this year that I really started focusing on and molding this blog, often with the help and support of you kind folk out there. I will be forever grateful for how you all helped me get this blog to where it is now. What's more, it was all of you who helped me through the loss of my sweet Rosie with your kind, caring words, for which I will always be thankful. And it was all of you who purred and prayed when all of my other furbabies went through their own medical issues throughout the year. And of course you were all also there with us through the many happy and fun times of our year! Thank you, all of my friends and furiends, for being there for my furbabies and I all this past year of 2015! Last but not least, I know my furbabies want a turn to give their thanks for this year of 2015. My furbabies always let me know in their sweet ways that they are grateful for their life with me, as I am for mine with them. They are grateful for their home and their food and the many snuggles we share. They are grateful for each other, and for their pawpaw and gammy and auntie. And they are of course thankful for all of you, our blogging friends and furiends! And, my furbabies wanted to give a special shout-out to their warm snoozie spots, and the blankies their gammies made them. Sometimes it's the simple pleasures in life that really keep us going. And so, on this Seventh Day of Christmas, I would like to wholeheartedly wish you all a Happy New Year's Eve! I hope that you all ring in the New Year with health and happiness, and with blessings beyond words! As you can see, Astrid is also of course still proudly wearing the festive bow her gammy made for her. So, Astrid loves the Christmas tree, and the Christmas food, and the plain and simple festive fun of Christmas. But, there is one thing that Astrid has made obvious that she does not like about the holiday. And that would be the Christmas music, most especially when her humans try to sing along. Christmas music is still on constantly at our house, and will be for the entirety of the Twelve Days of Christmas. 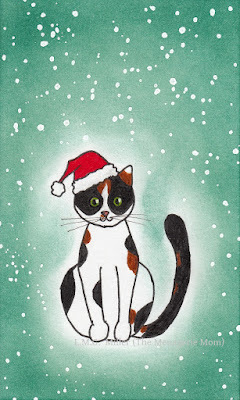 But, if the radio or the humans get too enthusiastic with the festive tunes, Astrid will quite literally huff off to the back of the house for some peace and quiet. Sorry, Astrid, sometimes we just can't help ourselves! Merry Sixth Day of Christmas! 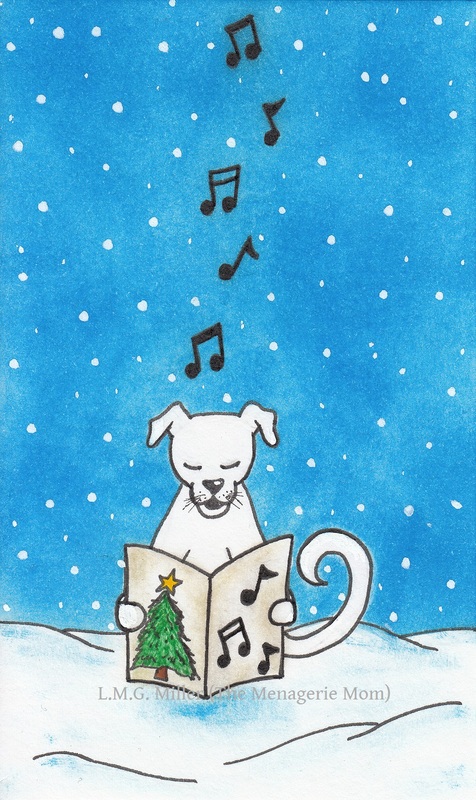 Is anybuddy else out there still enjoying all those festive tunes? Evan isn't my only little helper, though. I have some baking assistants as well, which I gave you a glimpse of in the recent post about our Christmas festivities. Remember this picture? I hope everybuddy has a very merry Fifth Day of Christmas! 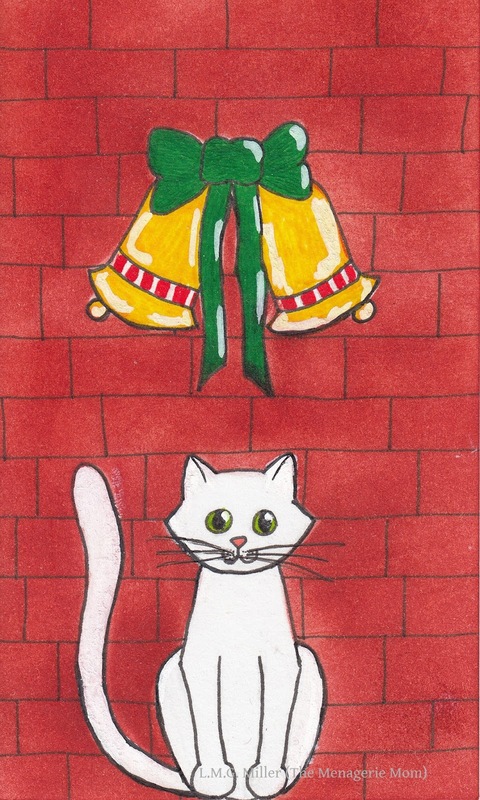 Mancat Monday, and more festive fun. This is a picture of my boy Evan snuggling with the cozy blankie his gammy made for him for Christmas. Although you can't see it, the blankie has cute animals all over it, including pandas (one of my favorite animals! ), owls, kangaroos, and turtles. And, as this post's title suggests, I'm going to continue the Christmas festivities for a while longer. Christmas Day was only the First Day of Christmas, so the lovely holiday isn't anywhere near over yet! My family has always had the tradition of keeping all of our Christmas decorations up until after the Twelve Days of Christmas are over. We also always keep the Christmas music playing until then. I'll be doing the same this year. 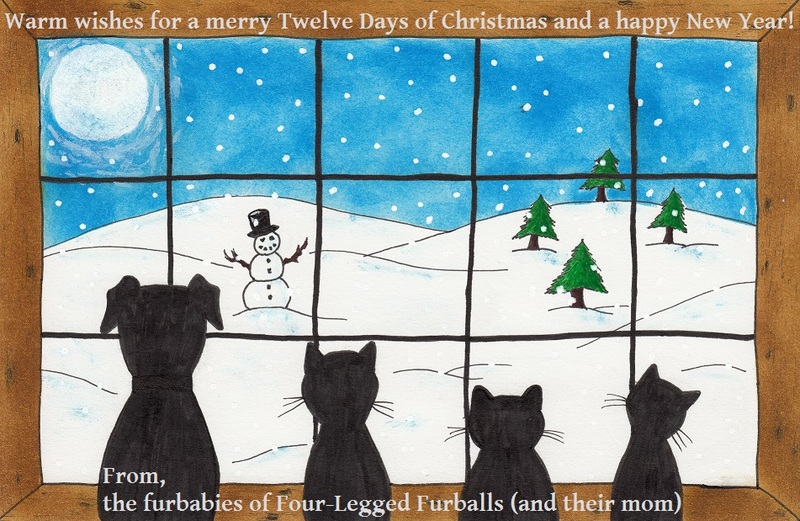 As it says, my furbabies and I want to extend our warm wishes to you and yours for a very merry Twelve Days of Christmas and a happy New Year! Astrid and Evan were determined to see the man in red. But, alas, their vigil lasted only shortly before the snoozies kicked in. Santa left the kitties some yummy new food to try and new catnip toys specially selected for each of them (he even left enough for us to share with Thimble's brothers and Pawpaw and Gammy's two little ladycats)! After waiting (not so patiently) for their mom to photograph all the goodies, the furbabies finally got to have their way with Santa's gifts. Before we knew it, the furbabies' pawpaw and gammy (my parents) arrived at our house to join the Christmas festivities. (Astrid thought seeing Pawpaw was about just as good of a gift as her new chew bones and moist food. After all, it had been a whole roughly 12 hours since she's last seen him!) Well, Pawpaw and Gammy certainly didn't come empty-handed. Gammy had made new fleece blankies for all of the furbabies! Thimble says, "Thanks, Gammy! I've been taking all of my naps on my pretty pink blankie!" This big boy got the toy shaped like a slice of pizza. I wonder why? ...if only Rudolph would have stopped creeping on him. Ladycats Gemma and Freya were all excited with the Christmas hype, too, but the camera shy girls didn't allow me to catch any shots of them. I'll have to try again soon, so that you all can see how the pretty girls have grown up. We hope everybuddy had as fun and festive of a Christmas as we did! Did you know that Christmas Day is actually just the First Day of Christmas? That being said, Merry Third Day of Christmas! For last week's Caturday Art post, I shared a drawing I made of my angel Rosie, which was part of a fun little series I decided to create for the furbabies in my life. 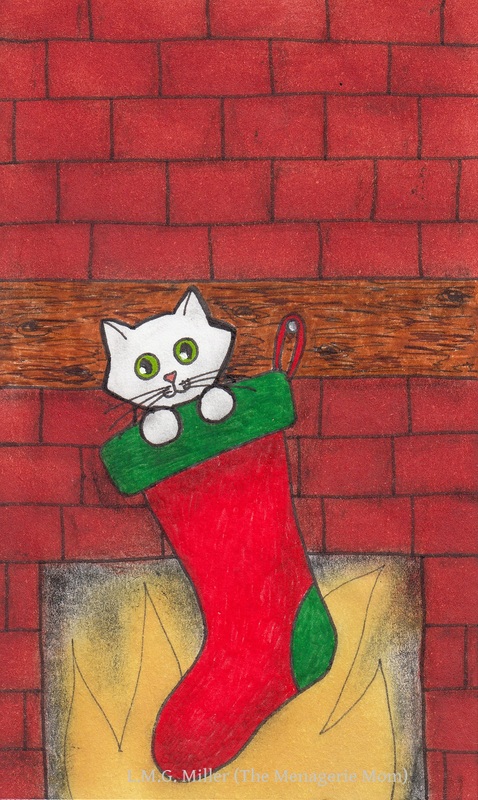 For this week's pawesome Caturday Art blog hop, hosted by Athena and Marie, I thought I'd share the next drawing I made in this perhaps goofy little set. This one is for Astrid, the sweet, cat-surrounded, goofball of a pup in my life. 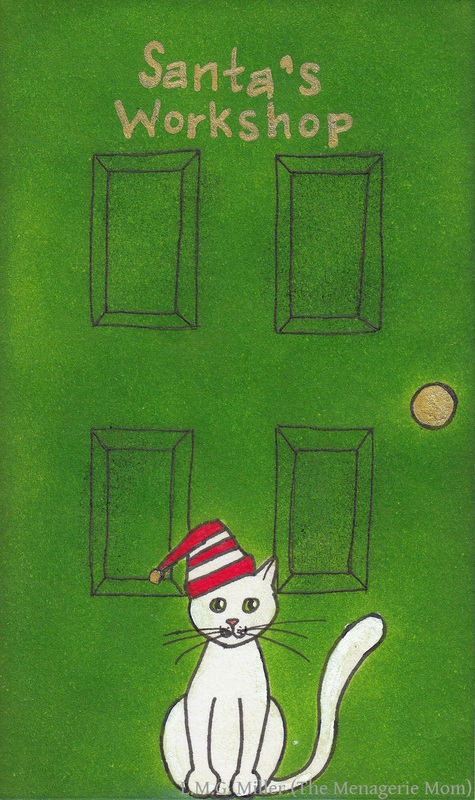 I know she's not a cat, so it's not really "Cat"urday Art. I apologize. I hope everybuddy had a very merry Christmas! Stay tuned, because our Sunday Selfie post tomorrow will be a little review of our Christmas festivities. To all of you dear friends and furiends of ours, we wish you a very merry, blessed Christmas! We hope that it is filled with family, friends, and festivities! Not that I have to tell you, but today is Christmas Eve. That means it's just 1 DAY UNTIL CHRISTMAS! 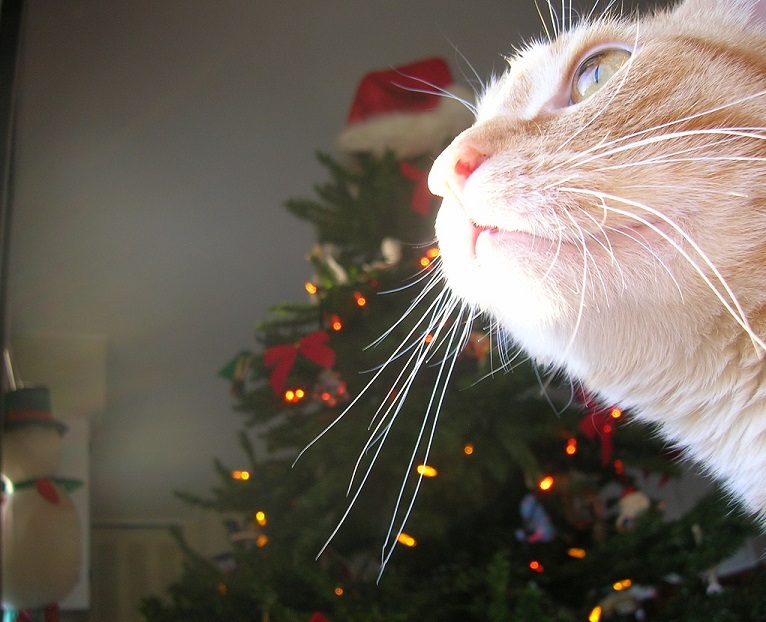 Astrid has been keeping a close eye on the Christmas tree, hoping that some early presents will show up beneath it. Sorry, Astrid, but you'd sniff out your gifts faster than I could blink. Of course, the same goes for the kitties. So, the gifts will have to remain in the safety of their hidey holes, at least for a little while longer. You'll just have to be patient, furbabies. Merry Christmas Eve, everybuddy! Santa Paws is coming to town tonight. Are you ready? My girl Thimble wants everyone to know that it's only 2 DAYS UNTIL CHRISTMAS! Happy Wednesday, furiends! 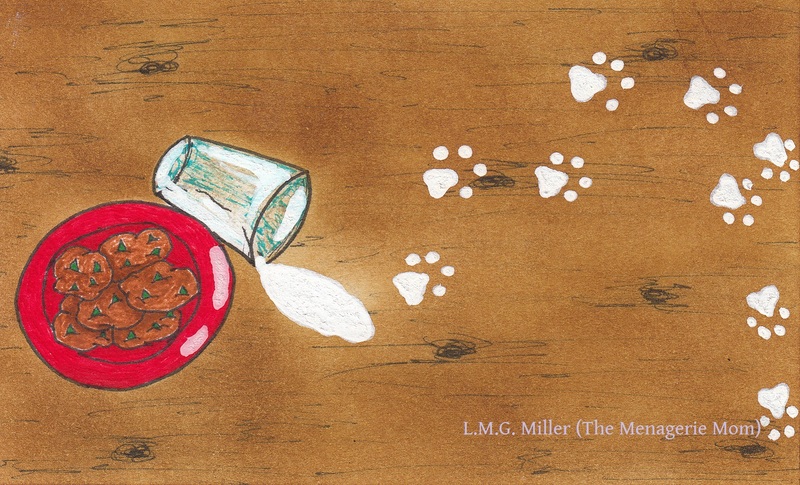 Have you made Santa's milk and cookies yet? My happy, active Eddy wanted to be the one to tell you that today marks only 3 DAYS UNTIL CHRISTMAS! True to her nature, she had a tiny bit of trouble sitting still for her Christmas photos (so festive Eddy is a blurry Eddy). Can you really blame her, though? After all, it's this little lady's first Christmas! 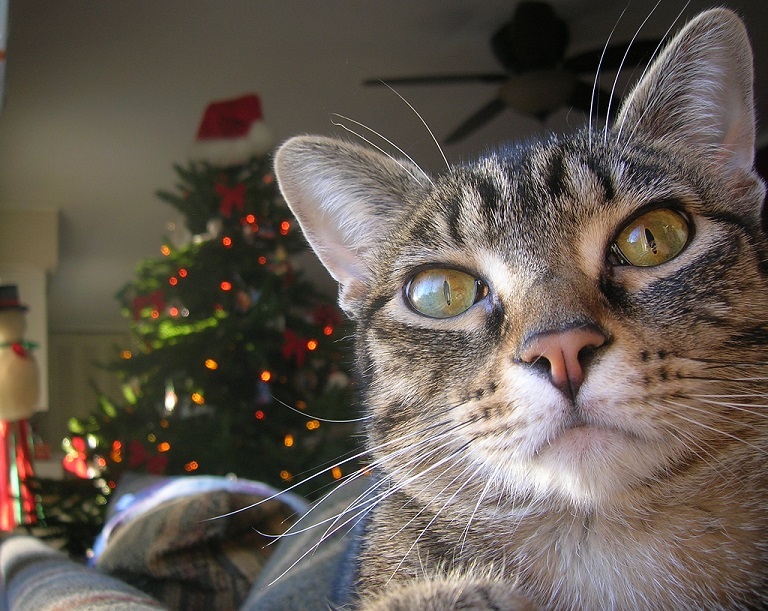 "Is Santa Paws here yet? Maybe over there? Is he over there?" "What about down there? Is Santa Paws down there?" Merry (almost) Christmas! I hope everybuddy is as eager for Santa as Eddy! 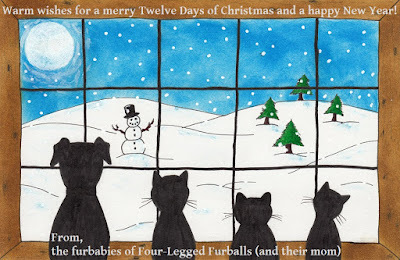 My furbabies and I will be doing a countdown to Christmas this week. Today, my mancat Evan is here to tell you that it's only 4 DAYS UNTIL CHRISTMAS! As a bonus, the other mancat in the house, my sister's cat Toby (remember? - Thimble's biological brother) would like to wish everybuddy a merry and very, very bright Christmas! Santa Paws will be here before you know it. All you furiends of ours are on his nice list, right? 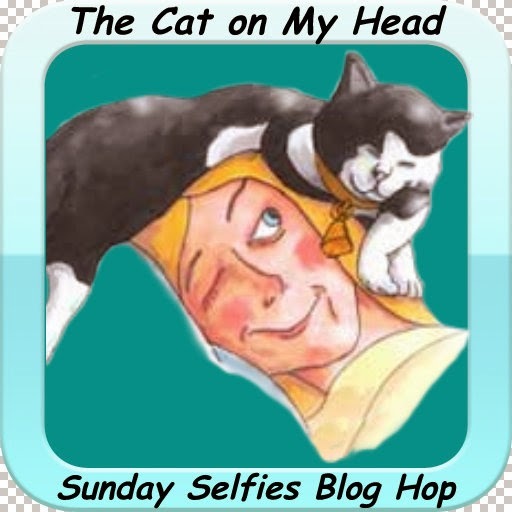 For today's Sunday Selfie blog hop hosted by The Cat on My Head, Evan and Thimble wanted to show off their sungazing selfies. They both made sure to stay festive during their sungazing - can you see our Christmas tree in the background? Happy Sunday, furiends! The countdown to Santa Paws continues! 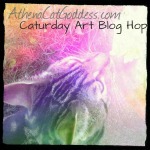 For today's Caturday Art blog hop hosted by Athena and Marie, I decided to share the first piece of artwork in a fun little series I've decided to create for the furbabies in my life. I'm creating, for lack of a better word, goofy little drawings to illustrate just some of the traits that I love about the furry ones in my life. I've taken some of their physical and/or personality traits and decided to just run with them. The first piece I created is, of course, for my sweet angel girl Rosie. As a brief explanation, Rosie was captain over all in our home, reigning supreme from her beloved living room couch. And, for her last few months with us, Rosie was one-eyed (following a necessary eye removal surgery). 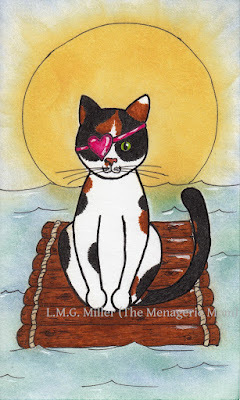 She was, as I called her, my cute little pirate. I hope that helps this little piece make at least a little sense for you. Happy Caturday, everybuddy! I hope you're all getting ready for Santa Paws to come to town! I don't often dress up my furbabies. Cute thought it may be, none of them particularly enjoy it, and I certainly don't want to torture them just for my personal enjoyment or entertainment. But, there is one way in which I can make one of my furbabies look festive, and without that furbaby's knowledge. That furbaby is Astrid, and her collar is the perfect place for adornments. Do you like Astrid's cute little snowmen friends? My sister and I have been accumulating a large number of ribbons for Astrid's collar since soon after we rescued her. The festive one you see her wearing above is actually far larger than the ones we usually put on her collar, but she doesn't even seem to notice it. It's also extra special because it was handmade by Astrid's gammy (my mom), and Astrid models it perfectly. We have ribbons of all sorts of colors for Astrid, and for pretty much all seasons and major holidays. The idea actually started early on with Astrid's gammy, who first bought some dog hair ribbons with elastic bands for us to put on Astrid's collar. This was actually a bit of a joke at the beginning, because ever since we rescued her, people always (and I really do mean pretty much always) guess that Astrid is a boy. So, Astrid's gammy got some ribbons to put on her collar in a joking attempt to assist people in their decision. To be honest, people still almost always start off by calling Astrid a boy, even with the ribbons. Regardless, we loved the ribbon idea, so we have continued with it. We hope everybuddy has as festive of a Friday as Astrid! Hmmm. Do you ever get that feeling like you're being watched? Could there be something spying on me from behind that cat tree? Surely not. My boy Evan wanted to show off his special little toesies on this Tuesday. This is a close up of the toesies on one of Evan's paralyzed hind legs. More often than not, when he moves around or sits or lies down (so, pretty much all the time), his back toesies are turned upwards as seen above. That means I get to see those cute pink paw pads all the time! We're wishing everybuddy a happy Tuesday! I haven't done one of my Awww Interlude posts in quite some time. So, here's one to hopefully help you smile on a busy Monday morning. I apologize that the pictures are blurry, but I wanted to show off the heart-melting expressions of my girl Thimble during one of our many belly rub sessions, and there's no keeping her still during that. I hope everybuddy has a great Monday! My whole gang decided to star in this week's Sunday Selfie blog hop hosted by The Cat on My Head. What's more, they all seemed to have come to a consensus to go for selfies on the more serious side.